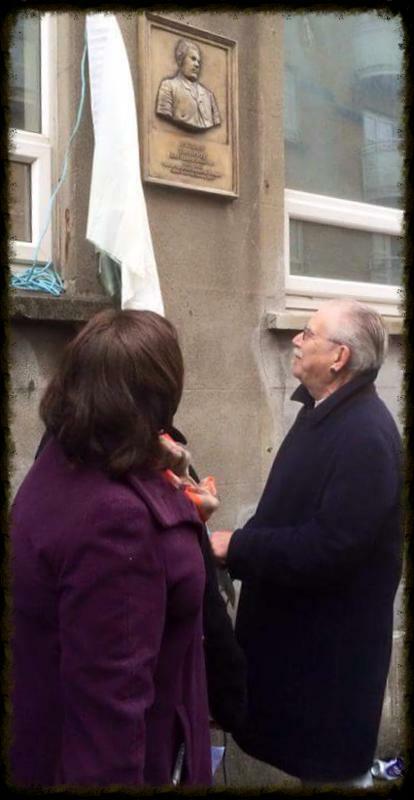 (Above) The plaque unveiled by Robert Ballagh at 22 North Anne Street, Dublin 1. 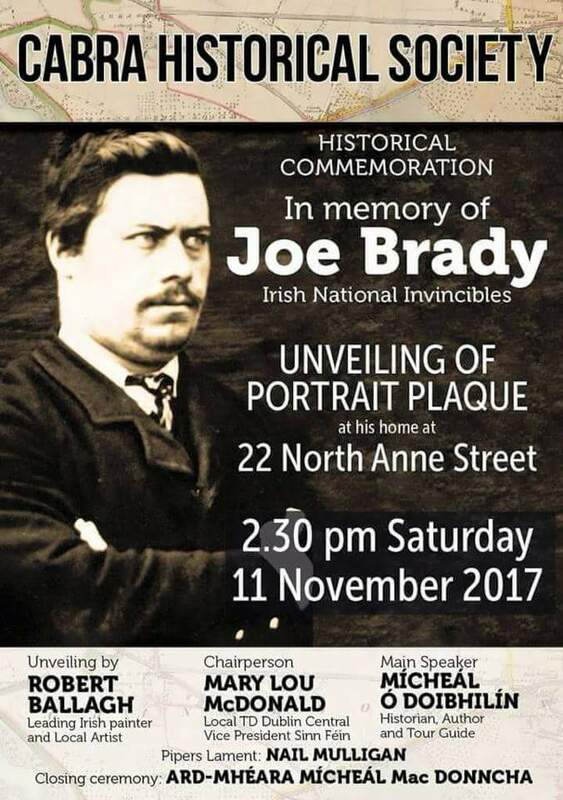 On Saturday November 11, 2017, Mícheál Ó Doibhilín spoke at the unveiling of a plaque to Joe Brady, Invincible, on the site of his family home - 22 North Anne Street, Dublin. Due to the inclement weather, Mícheál delivered a shortened speech. Here, however, we reproduce that speech in full. There is a view today that, in order to demonstrate our maturity as a nation and to properly understand conflict in Ireland’s past, we must understand the aims and objectives of all sides of that conflict. We must get inside their minds and think as they did, believe as they did, plan as they did. We must realise that the foe, as much as anyone else, was human, with human desires, human frailties, human fears. This is all very laudable, provided it is done fairly and with a clear understanding of what we are looking at. Today, in order to show our maturity, we are expected to remember those our forebears fought against just as much as those who fought for us. We erect monuments with the names of all combatants side by side, without distinction, or clarification as to which side – if any – they were on. Thus, we blur the boundaries between those who sought to take back what had been robbed from us and those who sought to hold on to their spoils, claiming that – because they had defeated us on the battlefield and in our homes in the past – they had a right of sovereignty over us. Indeed, I have noticed an undertone which suggests that we should view those who sought a free and independent Ireland at the expense of our foreign rulers as ungrateful, as vicious, as causing the unnecessary deaths of all who might die in conflict, overlooking the hundreds of thousands of deaths that might not have happened had we been left to our own devices. But I do agree that, if we are to understand the conflict that consumed 800 years of our past, we must, indeed, get inside the heads of both sides, the insurgent as much as the invader. We need to understand what drives ordinary people to do extraordinary things to free their country. Nowhere is this truer than the Invincibles, one of whom we commemorate here today. I am not the best person to speak on these – that honour should have fallen to my good friend, colleague and historian, Dr. Shane Kenna. Shane was THE expert on Fenianism and the Invincibles, and I know would have been proud to have been here, but regrettably he died earlier this year, a tragic loss to his family, and an irreplaceable loss to Irish historiography, and our sympathies go to his mother Olive who is with us today. Therefore, I will do my best in his sad absence. 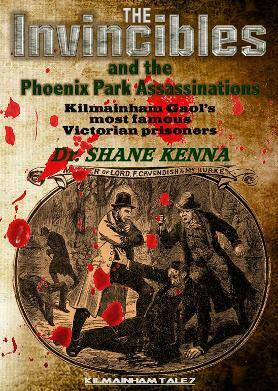 The Invincibles, we are told, carried out that dastardly act “The Phoenix Park Murders” on May 6th, 1882, when Lord Frederick Cavendish and Thomas Henry Bourke were savagely slashed to death in Dublin’s Phoenix Park, a stain on the pages of Ireland’s glorious history. Already, we have come across our first piece of manipulation – the use of the word “Murder” to describe what was patently a political act. Why “Murder”? Half a century later, on 28 June 1914, Archduke Franz Ferdinand of Austria, heir to the Austro-Hungarian throne, and his wife Sophie, were killed in Sarajevo when they were mortally wounded by Gavrilo Princip, one of six assassins coordinated by Danilo Ilić, a Bosnian Serb and a member of the Black Hand secret society. This act led directly to the First World War and of course is known ever since as “The murder of Archduke Ferdinand”. Well, actually, it is not – it is known as “The ASSASSINATION of Archduke Ferdinand”, the whole world calls it what it was – an assassination, an act of political intent. Eighty-one years after that, on November 4 1995, Israeli President Yizak Rabin was killed by Yigal Amir, in opposition to his policy of peace – yet this is not known as murder either but again as an assassination. So why “The Phoenix Park Murders”? Now, I would accept that the British – in their ignorance of the nuances of Irish history – might see the killing of Lord Cavendish and Thomas Bourke as murder, but surely we would have a different view? After all, this was an act carried out, not for personal gain, but to achieve political change for the benefit of all – therefore, in my book, an assassination. To call it otherwise is to change and control the narrative – a murder is senseless, for personal gain, a brutal, selfish and despicable act, while an assassination is for a purpose other than personal gain, a political act, an unselfish act. Indeed, Shane Kenna, a man who understood the nuances of 19th century history, especially the Fenians, better than any other, always referred to it as “The Phoenix Park Assassinations”, even in the book he wrote for my Kilmainham Tales series, believing and arguing that this was nothing less than a political act, carried out at grave personal risk for the benefit of all Irish people. Joe Brady, one of the people who took part, lived in the house that was here, in 22 North Anne Street at the time. He came from a large family and was the second of 20 sons and 5 daughters. A 26-year-old stonecutter he was, as you can imagine, a fine figure of a man, young, fit, powerful, in the whole of his health. One observer at his subsequent trial said of him that he was “a powerful young fellow, … for all the world like a tiger on a spring”. He was called “Bulldog Brady” by his friends, because of his powerful build, physical strength and single-mindedness. He had a shock of black hair and a good-humoured face. Pass him in the street and he was of no more consequence than many others you would meet at the time. Joe’s father, Thomas, had worked for Dublin Corporation for 40 years as a paver – a job of considerable standing at the time as the Corporation strove to improve the streets and laneways of this city. A staunch Catholic, he imbued his children with his faith too. Joe, even at 26, was still living with his family. As one of the oldest children and unmarried, he was expected to contribute to the upkeep of the large family. He was a good Catholic, and sang with his friend Tim Kelly in the Choir of the Franciscan Church in nearby Church Street – a church that was to later play a major part in nationalist events in 1916 and beyond. Steady and reliable, there was nothing to mark him as a future political activist or assassin. So, what made him, this young man with a comfortable lifestyle, friends and hobbies, a good future ahead of him, take part in one of the most terrifying acts against the British overlords in Ireland? What turned a young Catholic man into a vicious killer? could not pay their exorbitant rents. Everywhere they petitioned their British landlords to reduce their rents, but to no avail. Evictions were now again a common site – in 1881 over 1,000 families were thrown off their land by rapacious landlords and their agents. Unrest was everywhere and secret societies were becoming the order of the day once again. Charles Stewart Parnell and the Land League had tried to intervene, to get the British Parliament to help the small farmers, but to no avail. Instead, he and his colleagues were summarily arrested and thrown into jail as part of Britain’s campaign of coercion designed to suppress the Land league and farmer agitation. But this ploy backfired, and instead stirred up increased hostility to British rule. One person singled out for special hatred was William ‘Buckshot” Forster, Britain’s Chief Secretary in Ireland, the King’s representative here and titular head of government. He, ultimately, was responsible for implementing the rule of law on this island – the harshest in the British Empire. One organisation in particular, the Fenians, decided to do something about this and, with Parnell and the Irish Parliamentary Party, had been instrumental in the formation of the Land League and what Shane Kenna describes as the beginning of a “social revolution in Ireland between 1879 and 1882 known as the Land War”. This war could only have had one conclusion – the removal of British landlords and, therefore, the practical ending of British control of Ireland. But this was a case of making haste slowly – too slowly for some. While the Land War began as a non-violent conflict, increasingly there was violent agitation and confrontation, but the power always remained with the forces of power and privilege. Using draconian laws and military might, such as the Coercion Bill, the elite fought back. The leaders of the Land League were imprisoned, as I said, including Parnell and Davitt. But, as was to happen again during the War of Independence with the German Plot arrests, this only removed the moderates, leaving the extremists and men of action in the field. In the words of Shane Kenna: “With the No Rent Manifesto and imprisonment of the Land League leaders, violence escalated throughout the country, secret societies such as ‘Captain Moonlight’ were on the rise, and cattle maiming, physical attacks and arson became daily occurrences”. The Land League was proscribed and Parnell, as part of his “Kilmainham Treaty”, agreed to let it die a peaceful death. It was out of this confusing agitation and unrest that the Invincibles were born. With financial help from the USA, Fenian John Walsh from Middlesborough, England was sent to Ireland to meet local Fenians. He made his way to Peter Street where he met Edward McCafferty, a van driver and Fenian of long standing. He introduced Walsh to the successful builder and staunch Catholic, James Carey, a Republican who believed that national and social causes were two sides of the same coin. Carey had joined the Irish Republican Brotherhood in 1861, and rose to become a member of its Directory. He was a member of a vigilance committee established to identify and remove Castle spies from the IRB. 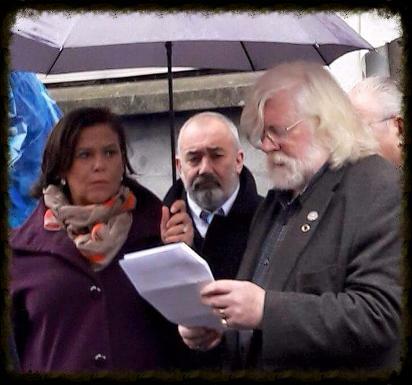 Walsh told Carey he had been instructed to establish a society – an assassination squad – to “make history”. Its objective was to be to “remove all tyrants from the country”. Carey agreed to be part of this and thus the Invincibles were born. James Mullet and publican Daniel Curley were quickly drawn in and these four were to form the Dublin Directory of the Irish National Invincibles, being sworn into the conspiracy in Carey’s home in Denzille Street. It was Curley who recruited young Joe Brady, already a Nationalist and Fenian and secretary of his Fenian circle, who brought with him his best friend and fellow chorister, teenager Timothy Kelly, an apprentice coach-builder. This Directory was to direct operations in Dublin, and plan potential targets for political assassination drawn from the upper echelons of the British administration here. According to Patrick Tynan their aim was to make British administration untenable in Ireland, regularly assassinating British administrators. A high priority would be placed on the Viceroy, as the British Queen’s Irish representative, the Chief Secretary, as the Government’s most prominent Irish minister, judges as a key pillar of the political establishment, and police acting as collaborators in the administration of British rule in Ireland. To achieve this a working-class membership – drawn from the ranks of the Fenians – was gathered, and a list of possible targets drawn up. First was Chief Secretary Forster, who, despite several attempts on his life, eventually escaped to England after he resigned from his post in the wake of the release of Parnell from prison. Another prime target was Thomas Henry Burke, permanent Under-Secretary at Dublin Castle. Burke was an Irish man, a Catholic, and a civil servant of 30 years standing. He had been Under-Secretary for some 13 years and was the man responsible for the practical administration of coercion and British rule in Ireland – a role he appeared to fill with vigour. Every new British law, every new British curtailment of Irish rights, every new British tax, he implemented and enforced to his maximum ability, despite what he was doing to his fellow Irishmen. He was a Castle Catholic of the worst sort, having become more English than the English themselves. a despicable Irishman and a logical target. Of course, a target was no use if you did not have weapons. Tim Carey suggested the use of knives. These are silent which, depending on location, may be important. They suggest to the world the bravery and intent of the attacker – who must get right up to his victim to kill him, to be seen by the victim, unlike someone with a gun, who can assassinate from a safe distance. Perhaps, too, it was seen as a fairer method of execution – face-to-face, unafraid. Further, by leaving a bloodied corpse with several wounds, one can suggest the ferocity of the attack and better terrorise the victim’s colleagues. This latter point was important. The planned assassinations were not intended just to kill, but to terrify, to act as a warning to other British administrators in Dublin Castle to cease their activities or receive the same fate. This was a tactic to be later employed by Michael Collins and his Squad against the Castle detectives such as the Igoe gang during the War of Independence. Adye Curran. Any suspect summoned to this court was placed under oath and refused legal representation. He would be compelled to give evidence at any subsequent trial or face imprisonment. Working with Mallon, the judge understood he had to get hard evidence against the Invincibles which would stand up in court later. information on the members of the Invincibles and those who took part in the assassinations. On the night of January 12, 1883, 17 Invincibles were arrested and housed in Richmond Gaol. A further nine were arrested over the next few days. Fear now stalked the city as its citizens awaited the police’s next move, but there was none – they had their men, and knew it. brought to Green Street Courthouse and charged with plotting to kill Government officials. 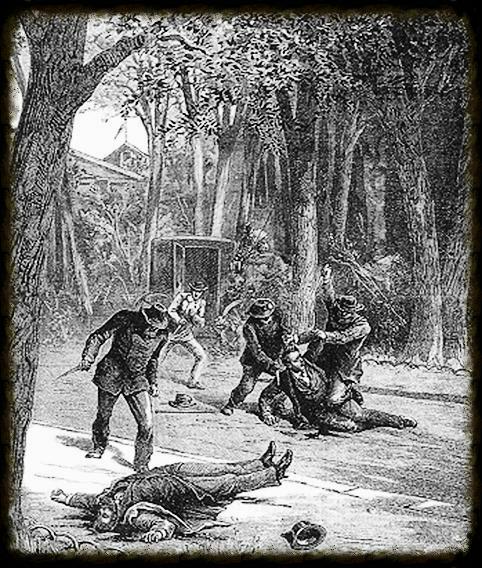 (Above) Perhaps the least sensational contemporary illustration of the Invincible attack on Thomas Burke and Lord Henry Cavendish in the Phoenix Park, May 6th 1883. The woodlands are fictitious. In the words of the late Shane Kenna: “Terrorism is a war of attrition, seeking to coerce political elites, through the intimidation of public opinion, into yielding ground on a pervading political grievance”. necessary, cut through bone. An ideal knife was selected and a Dr. Hamilton Williams purchased them in London from Weiss & Son, a well-known instrument maker of London’s Bond Street. These were surgical knives of about 11 inches (c.285mm) in length, razor sharp and points like a stiletto. Through Hamilton Williams the knives were passed to Maurice Collins, a cobbler at Bethnal Green and an IRB activist. to the court from the Gaol through what is now erroneously called the “invincibles’ Gate” – it had actually been built quite some time before, possibly while the Victorian East Wing was being erected. Quickly the trials began. By February the third eight prisoners had been on trial, facing informers Farrell, Myles Kavanagh, and George Smith. Eventually finding their way to the Palace of Westminster, the knives were stored in the Land League Office in Frank Byrne’s room until he gave the knives to his wife who, heavily pregnant, smuggled them into Ireland concealed under her skirt. Byrne had predicted the authorities would not search a heavily pregnant woman and by early 1882 she had supplied the Invincibles with weapons including 4 rifles, 10 knives, and 8,000 rounds of ammunition for the guns, most of which was hidden in various safe houses in Dublin. Due to the arrest of the Invincibles’ chairman James Mullet on suspicion of assassinating an IRB informer, Edward Cafferty was elected in his place, but he was soon replaced by Daniel Curley and then Joe Brady was co-opted onto the Directory in lieu of Mullet. had a clear chance to kill him, he was with his wife and daughter, so they refrained. As already noted, Forster resigned as Chief Secretary in disgust at the release of Parnell from Kilmainham Gaol, and his Viceroy, the Earl Cowper, followed suit. They were immediately replaced by John Spencer as Viceroy and Lord Frederick Cavendish as Chief Secretary, while Burke remained as permanent Under Secretary in Dublin Castle. Carey did a deal with Mallon. When Carey appeared for the prosecution in Court, shock ran through the Invincibles, each looking with disgust at him and shouting abuse, forcing intervention by the judges. Carey was denounced as a scoundrel, a thief and a liar. Skin-the-Goat, particularly vocal, denounced him as a perjurer for money, while Joe Brady gave him an icy stare, his eyes full of anger, one commentator recalling “had Joe Brady, who glared at him, and stretched forward towards him, been able to reach him, I believe he would have been torn to pieces, for Brady was a powerful young fellow, he was, for all the world, like a tiger on a spring”. The trials, by today’s standards, were a mockery of Justice, relying as they did almost completely on the word of informers. Punitive sentences were handed out, the most severe and the ultimate sentence the Law would allow being given to Joe Brady, his friend Tim Kelly, Daniel Curley, Michael Fagan and Thomas Caffrey, who were all sentenced to be hanged by the neck in Kilmainham Gaol until dead, then to be buried there in unmarked and untended graves. Brady was a favourite with prison officials for his fortitude and good humour, and was given an ivory cross by Lady Lucy Cavendish, the chief secretary’s widow. 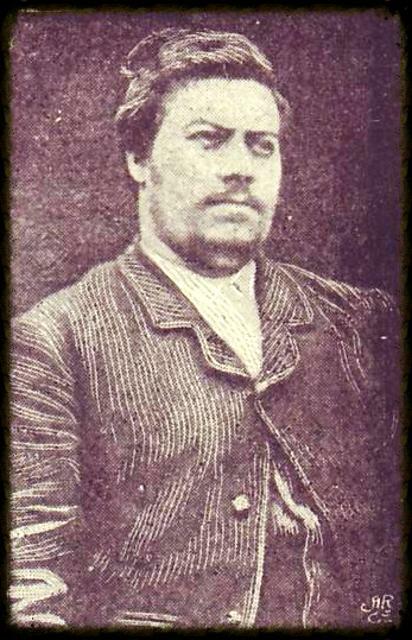 Joe Brady was the first to be executed, May 14th, 1883. Spencer and Cavendish were wildly welcomed on the streets of Dublin when they arrived on May 6th, 1882. They made their way to Dublin Castle where, amid much pomp and ceremony, they formally took on their new roles. When the time came to leave, Cavendish decided he would walk to his new residence in the Phoenix Park, now the US Ambassador’s residence, and he strode purposefully along the Quays and into the park. Burke, meanwhile, decided to get a cab home. He also lived in the Park and, as he travelled up Chesterfield Avenue, he saw Cavendish and offered him a lift. Cavendish declined so Burke instead alighted to walk with him – a fateful and fatal decision. As the two men walked along, chatting and getting to know one another, other pedestrians came towards them – three men together, followed by another two, with yet another two behind, all working class in appearance. The trio – Curley, Fagan and Hanlon – passed harmlessly by, as did the next pair – Joe Brady and his friend Tim Kelly. But suddenly Brady turned back, his knife drawn, and stabbed Burke, shouting “You villain”, the blow piercing Burke’s heart. Burke struggled, but to no avail. In total he received 11 wounds, including several defensive wounds to his hands and his throat being cut. Cavendish, brandishing his umbrella, attempted to intervene and Kelly turned on him, stabbing the First Secretary in the right shoulder. They struggled, and Cavendish received several wounds in his arms, his chest and his neck. Eventually he fell to the ground. To make sure he was dead, Brady leaned over him and slit his throat, removing the only witness to what they had done who could identify them. Brady, Kelly, Caffrey and Delaney now mounted Myles Kavanagh’s cab but Joe had to dismount again to retrieve a revolver he had dropped. Now began a wild drive as Kavanagh whipped his horse and the cab sped out of the park, through Chapelizod, past Kilmainham Gaol, through Inchicore on to the Naas Road, heading all the time out of Dublin towards Tallaght and the open countryside, eventually passing through Crumlin village. Now they swung back towards the city, heading for Terenure. Here Tim Kelly alighted and got a tram to Dublin City. The remainder went on to Ranelagh and then Leeson Park before entering Davy’s pub in Leeson Street. They were on the opposite side of the city to the Phoenix Park, which they hoped would give them an alibi if questioned. The other three – Curley, Fagan and Hanlon – had been driven by ‘Skin-the-Goat’ Fitzharris through Phibsboro into the city centre. There, Curley went to the offices of the Express newspaper and dropped in cards which read “Executed by order of the Irish Invincibles”. Now the hunt for the killers began. Inspector Mallon, the best detective in Ireland and one of the best in the then United Kingdom, was on the case. He arranged for the telegraph offices to remain open the next day, Sunday. He contacted the major ports and determined that the ferries had departed before the assassinations, and ordered Castle detectives to go to RIC stations outside County Dublin to co-ordinate the investigation. All cabs in Dublin City were paraded before the detectives and examined. The Liffey was dragged in case the men had dropped their weapons there. Quickly Mallon identified the perpetrators but, without evidence, could not arrest them. William Marwood was brought to Ireland for the purpose, and Joe died swiftly and bravely. After the execution William Carte, the prison doctor, performed the usual autopsy and declared that Joe was, indeed, dead, and had died by the snapping of his neck and spinal cord in accordance with his sentence. Next, he severed Joe’s head, washed and cleaned the body and placed it in a rough deal coffin. A hole had been dug in the earth of the Gaol’s graveyard near the gallows and Joe was placed there. His body was covered with shovelfuls of quicklime, and covered over with earth. No marker was placed on or near the grave. Joe’s head was wrapped in a cloth and given to Inspector Mallon to take to the Royal College of Surgeons, which seemed to unnerve the usually unflappable detective. He quickly overcame his queasiness, though, and obtained a vertebra from Joe’s backbone, which he carried with him in his coat pocket for ever more, perhaps to give him some of Joe’s courage. 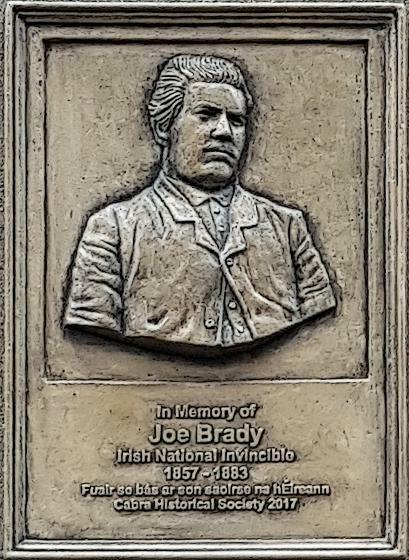 And there end’s Joe Brady’s story – one of a brave young man who carried out a vicious, shocking attack on Thomas Burke, and took part in other Invincibles’ activities. Their idea had been, like the Dynamitards who were to follow them, to spread terror, to scare landlords and Government officials so that they would stop harassing the Irish. Because of the unrest in Ireland at the time, so-called normal agitation and crime received minimal coverage in the media. However, by executing a small number of particularly brutal assassinations, the Invincibles could manipulate the burgeoning print media to maximise their publicity and increase the terror effect of their deeds, and scare their enemies. They certainly achieved their objective of much publicity. Even today their attach on Burke and Cavendish is remembered, though incorrectly as murder. But perhaps it was the courts that were to have the final say in all of this. The executed men were to be buried in Kilmainham Gaol in unmarked and untended graves there. Although Kilmainham Gaol is no longer a jail but a major tourist attraction, these five brave men, who did what they did – not for themselves, but for us – still lie there in unmarked and untended graves. When I worked there as a tour guide, when Shane Kenna worked there, we took visitors to the spot where they were buried and explained who they were, pointing out the plaque that was placed on the wall there by the Restoration Society. We did that until we were ordered to stop and, eventually, doors were locked and access to the yard was blocked off and, today, they still lie there, forgotten. 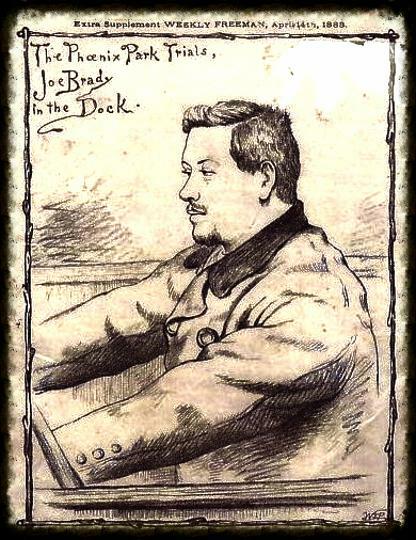 Like the others, Joe Brady never denied his part in the assassination of Cavendish and Burke. He did not glory in it, but accepted his punishment, believing he had struck a blow for Ireland. The sentences the court handed down to Joe “bulldog” Brady, Dan Curley, Mick Fagan, Tom Caffrey and young Tim Kelly were completed when Kilmainham Gaol closed in 1910 and they should have been released. They have been kept there illegally for 107 years and counting. Shane Kenna wrote to the Minister some years ago requesting their removal to no avail. Today, we need to take up that plea again. We have relatives of Joe Brady here today who would like to have their relative get a decent burial. Glasnevin will take them. Why are they still in Gaol?" 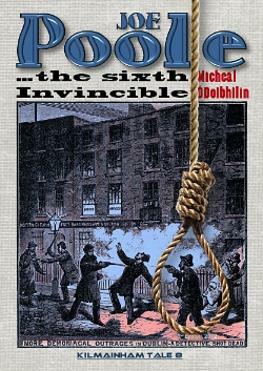 To find out more about the Invincibles, read "The Invincibles and the Phoenix Park Assassinations" by Historian Dr. Shane Kenna, available here and "Joe Poole - the sixth Invincible? by Mícheál Ó Doibhilín here.